Skip in a modern stadium! 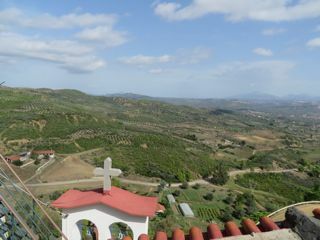 Beautiful view from the Monastery. So far our journey has taken us on the Sea of Marmara, The Mediterranean Sea, The Aegean Sea and now the Ionian, soon to enter the Adriatic. . I mention these seas because I am surprised and thrilled. Today we docked as we starred into the Ionian. It really exists. Of course it does, but exists with us about to travel into the countryside out and beyond the headlands of Katakolon. Back in February I contacted Andrew Stathopoulos a well-recommended Taxi Tour person living in Pyrgos the little village next to Katakolon, our port. He was so happy to see us emerge from the ship early and we were as happy to see him. He told us how lucky we were because the day before our arrival it rained steadily for six hours. The ships in port that day would not let their passengers off the ships. Oh can I tell you, they really missed something special, very special and we are so lucky to have experienced our day. 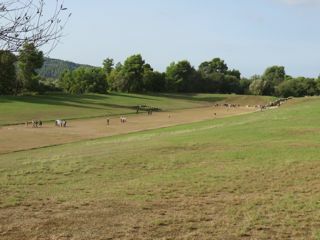 First we headed to the ancient site of Olympia where ancient Greeks came every four years for over a millennium to celebrate the sacred games dedicated to the Greek God Zeus. Of course it is in ruins, but we purchased a book showing it THEN and how we were seeing it TODAY, certainly non-distinguishable. Every time they light the torch for the Olympic games, they come to this spot and celebrate, then send the torch on to its next sacred destination. After viewing the ruins, we went to the Archeological Museum to see bits and pieces from the era dating back to the beginning of the Olympic games. My question comes into full force, how did they know the building looked as they say it did, how did they know the colors, and how much of the sculptures they showed did they add? How do they know Zeus from Poseidon or Hadrian? Perhaps they guessed well. We drove through beautiful valleys and vintage villages. We stopped to have a Greek coffee, by the way strong, gritty and delicious, but accompanying the coffee was free Wi-Fi. Hard to judge which I enjoyed most. We were able to get some of your lovely emails. Thanks for the updates. Across from our coffee place, Skip found a statue (packable) of his girlfriend Athena. This area is recovering from a nine-day fire six years ago. They lost many of their trees, but to me the area has recovered, is a beautiful landscape and so relaxed. We had an opportunity to drive up to The Hanging Monastery where women take a vow to live at the top of this mountain for life. The reason this monastery is placed here perched on the top of the highest location is because they found an icon of the Virgin Mary high on this mount and took it down to the village. After only a few days it was missing from the village and found high atop the mount once again. After a few more times, they decided to build the monastery on the spot the icon was discovered and had returned so many times. I think it was an honor to visit this spot and be a part of this special place for only a tiny amount of time, but the huge feeling of love and respect that developed in our memory remains. On the way back to the ship Andrew stopped and bought us baklava and cookies, took us by his home showing us that he had done all the work by himself and topped off the day by giving us a bottle of olive oil he grew, picked and processed himself. What a fellow! 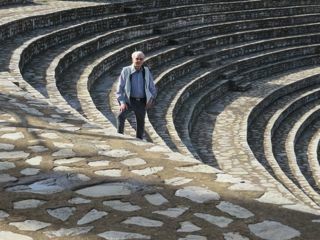 weird running or walking on the same track used hundreds (or thousands) yrs ago! 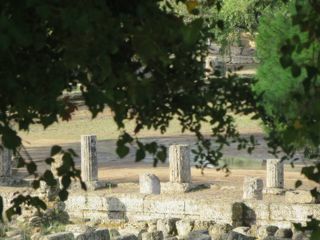 We were lucky to drive thru that area in a rental car..Sparta, Olympia, Naflio, etc. Truly wonderous! Enjoy the reminder of your trip and safe travels…what cruise line are u taking?? Once again, love those blogs and pix!